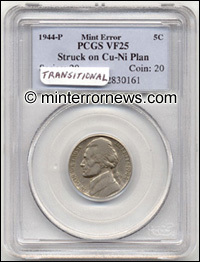 This is a 1944-P Jefferson Wartime Nickel transitional mint error. It was struck on a copper-nickel planchet rather than the intended Wartime silver alloy planchet, which did not have nickel composition. The composition should have been silver, manganese and copper. In 1942 the composition of the nickel was changed so that the nickel alloy could be used in the materials produced for the War. Since this composition was changed by the United States Mint in 1942 and continued through 1945, this left the possibility of several transitional mint errors to occur. 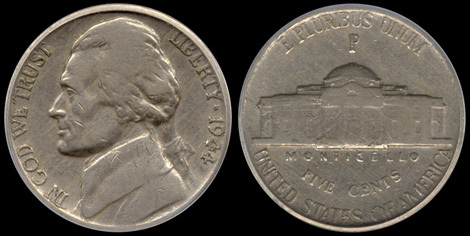 There is reportedly a unique 1942 pre-Wartime Nickel struck on a silver Wartime composition planchet and several Wartime nickels struck on nickel composition planchets prior to this change. What makes this Wartime Transitional so exciting is the date - 1944, two years later than the change over in 1942. There is one other 1944-P Jefferson Wartime Nickel TRANSITIONAL that was recently featured on Coin World Online and in the July 2, 2001 Issue. This Transitional was authenticated and encapsulated by PCGS and was graded a conservative VF-25. This Wartime Nickel Transitional is actually rarer than a 1943 COPPER CENT. Several of the 1943 copper cents have sold in the $75,000 to $200,000 range. Copyright Ⓒ 2005 minterrornews.com. All rights reserved. Legal notice.